Well, this is my starter char for synthesis, having a lot of fun clearing the game, leveling while being able to clear all content without any trouble. The main skill is Bane for most of the stuff and using Soulrend to help with troublemakers with the help of wither totem. The build is made the trickster ascendancy, which is really strong this league, with Patient Reaper recovering instantly Life, ES & Mana on Kill. Ghost Dance for some MS and Evade boost while recovering 5% of your evasion rating when you get hit, at 34k evasion we are talking about 1700 ES instant regen when you get hit ! Escape Artist gives you more ES and evasion from your chest and helmet while making you almost Stun immune and giving you more dodge. And Prolonged Pain for a great DPS boost. + Really light on visual effects, great for old computers. + Quad curse but only applying 3, you get one left for party play. + Trickster makes you almost invulnerable in maps. - Guardians can be tricky to do in no regen maps. - Needs a bit of investment to be able to kill Uber easily. 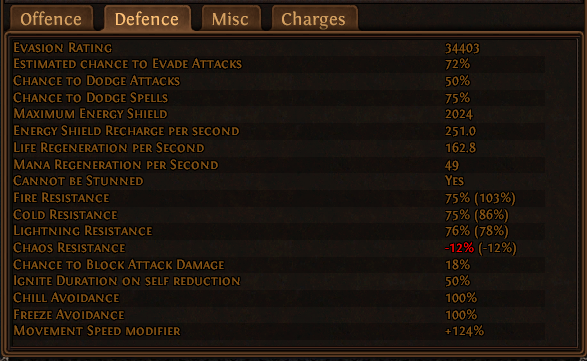 Cospri's is a must have for this build, High Evasion, Chaos resistance, Additional Curse and Hexproof removal. This chest makes you able to run all mods and keep your dps high even on hexproof rares. 5L is strongly recommended and should be enough for doing T16 maps, but a 6L will be a great QoL for bossing. The only really important stat is Non-Ailment Chaos Damage Over Time Multiplier, and the one that you really want absolutely to get. This trade search should be enough for all content, just craft spell / chaos / DoT Damage depending on what you can craft with the bigger number. Vixen's are BiS for this build. You are going to apply 3 curses while using your main skill. I'm linking Despair and Enfeeble with Empower and Enhance to boost the power of these 2 curses for some defensive and offensive boost. Vixen's +1 Gem level are really good for this build and not too expensive. Atziri's Steps are a must have, life, spell dodge and 30% movement with high evasion. I went for an hungry loop for a 5L soulrend to help with the DPS on single target, you can use a 4L setup while the gems are leveling up instead of the CwDT setup. Here just take some helmet with high life, high ES and some resistances. You are going to prefer an high evasion shield with life and resistances. Rest : Cospri's having a 183 dexterity requirement, you are going to get some on your ring and amulet, so that's a major brake to our gear, but outside of that just get Life and Resists on the ring, and belt. Passive order : Patient Reaper, Ghost Dance, Escape Artist and Prolonged Pain. - Minor : Soul of Abberath with upgrade highly recommended ! You just need to walk and Bane everything on sight, while keeping all flasks up. You have to be careful with corrupted blood, it builds really fast, so watch out for the debuff and be ready to use you antibleed flask or just get an Conqueror's potency with the implicit "Corrupted blood cannot be inflicted to you". For boses same tactic, just keep your wither totems up, and try to get some soulrend dps going. Still in construction, leveling part coming soon, feel free to ask any question ! can you tell me what to take first and what to leave for late game in the tree? Why cospri? Only because of the extra curse? You can craft that from Betrayal. 200 dex, is pain. You don't poison in any way. Cospri has low defense. Or because of hexproof?